Mountainpanoramas is the website for you, if you urgently need the mountain feeling but cannot haunt the mountains yourself. Mountainpanoramas shall give you that feeling wherever you are »like being there yourself«. Move around in full screen mode and explore the mountains from your desk. I started panoramic photography 11 years ago and collected a lot of high resolution panoramas. Due to limited bandwidth and poor player technology it was not possible to publish them adequately on the internet. Now technology and bandwidth are available and I found some time. I brought my vision with a few of my ideas live. More will come. Enjoy Mountainpanoramas. Thanks to all friends who supported and motivated me to build this website, especially to Roland Hoffmann contributing beautiful panoramas as the first photographer, to Markus Glatter who helped me with PHP programming, to Dirk Becker who posted a lot of panoramas taken at stunning places while the site was not live yet, and to my family for the patience and support during launch of this project. Operation of this website is not for free. Please understand that I have to cover my cost by allowing selected sponsors to place their ads. Giving Mountainpanoramas a link in your website is very much appreciated. When you link please stick to the rules laid down below. Thanks. In case you have a space for a picture link please use the link button above in your website. There are different ways to become a sponsor of Mountainpanoramas. In case you are interested in advertising, please contact me by mail. There is only one prerequisite: the thing you want to advertise for has to have something to do with either mountains or panoramic photography. You need a modern Browser like Firefox 3, IE 7/8, Google Chrome 3/4, or Safari S4 in order to enjoy this website with all its functions. Java Script must be enabled. Mountainpanorama's technology is based on Flash. The latest version 10 of Adobe's Flash Player Plugin is required. Get it here. Many of the panoramas are about 200 Megapixel allowing zoom-ins to the finest details. Mountainpanoramas's technology supports those high resolutions at minimum download time. All Panoramas are labeled with summit names and other geographical information. Learn how to view the labels from the Little User Handbook at the left side of this page. Search for the green labels. There is the next panorama. Click on the label for Panoramic Hiking to this point. With growing numbers of panoramas it will be possible to completely cross whole mountain regions. The panoramas are correctly aligned regarding point of the compass. 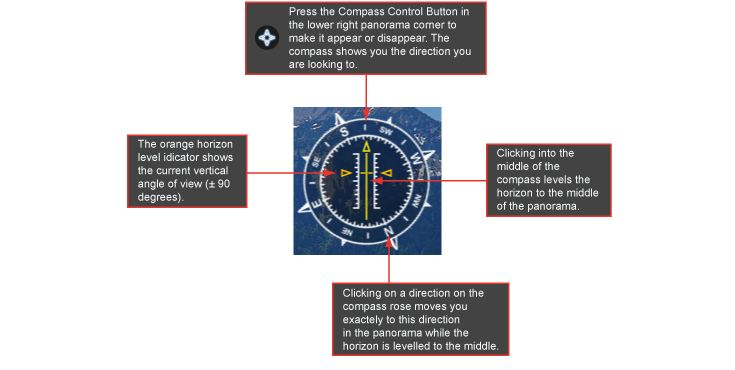 How to display the integrated compass is explained on the Little User Handbook at the left side of this page. Clicking on a panorama thumbnail box looking like the one shown left opens a browser window with the panorama. You can find those boxes on the Panoramics Page where all panoramas are represented with such boxes. For new panoramas the Home Page contains a section New Panoramics consisting of similar boxes representing the latest panoramics published. A click on any position within the box opens the entire panorama directly in a new full screen browser window. The other possibility to open a panorama is to use the Panorama Locator map on the Home Page or on the Map Page. Click on the Continent marker (shown left with the red panorama counter) in order to zoom to the region. The region markers with the blue counters appear (see middle of the picture left). A click on this marker zooms further to the panorama marker icons. Move the mouse over the marker icon and a description box shows up (see right side of the picture left). Now click on that box and the panorama will open in a separate browser window. Now you can move around in the panorama. Place the round mouse cursor about in the middle of the panoramic image and hold down the left mouse button. A four arrow cursor shape appears. While keeping the mouse button down move the mouse into the direction you want to move in the panorama. Release the mouse button to stop the motion. The zooming function is assigned to the mouse wheel. Just turn it to zoom in and out. 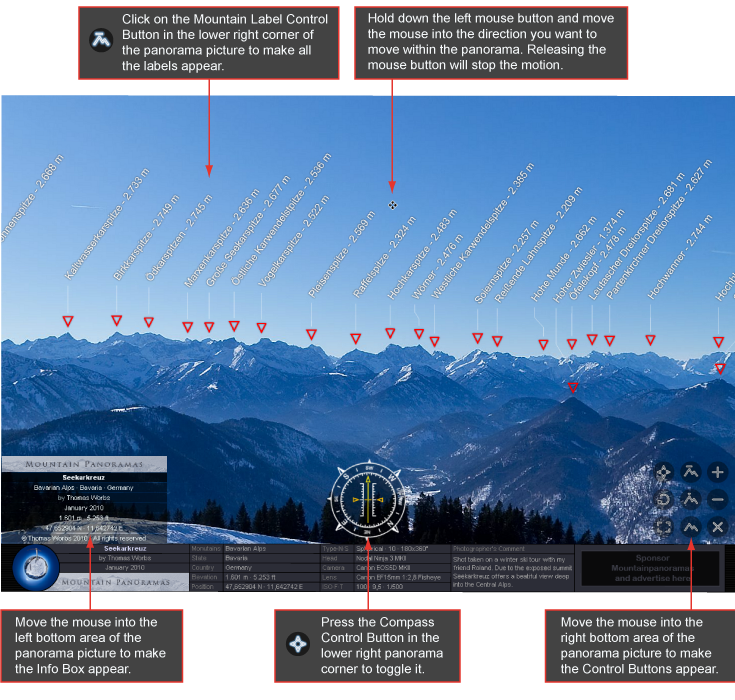 Mountainpanoramas offers several control functions in its viewer. In order to access them move the mouse cursor into the right bottom area of the panoramic image. Now the Control Buttons fade in. The specific functions of the Control Buttons are explained in the next chapter. In case the zoom stops you have reached the maximum zoom factor. In case the zoom stops you have reached the minimum zoom factor. Clicking this button exits the panorama and closes the panorama window. When clicking this buttons all the labels are shown inclusive label text. Marker button. When clicking this buttons only the arrows of the labels are shown without text. Moving the mouse cursor over an arrow will fade in the text of the specific label. Clicking on this button switches off all the labels, the arrows as well as the label text. hides the compass when its visible. it stops, when off, it starts. Fullscreen button. A click on this button toggles between fullscreen and normal mode. Please note that the keyboard control is disabled in fullscreen mode. When you have switched on the labels (Control Button to switch on see above) you might detect labels with green arrows. A green label means that at this place there is another panorama. Click on the label and you will be transferred to this panorama. This function enables you to virtually hike through whole mountain regions. At the moment the network of panoramas is not completely connected through these links but by and by with growing number of panoramas this will change. Try Guffertspitze as a good starting point to experience Panoramic Hiking. In order to determine the direction you are looking to, switch on the compass by clicking on the Compass control button on the bottom right corner of the panoramic image. The indicator in the middle of the compass also shows you the current horizon level. The compass in Mountainpanoramas is not an indicator only. It has some built-in navigation functions. Clicking into the middle of the compass (into the horizon level indicator) levels the horizon exactly to the middle. Clicking on a direction on the compass rose moves you to that position within the panorama while levelling the horizon to the middle also. if you want to access the Info Box of the panorama, move the mouse cursor to the bottom left corner of the panoramic image. The Info Box contains the metadata of the panorama and the copyright information. This feature has been implemented for the full screen mode as in this mode the footer, normally containing all information about the panorama, is not visible. When not in fullscreen mode you can also use the arrow keys of your keyboard to move within the panorama. 'LEFT' / 'RIGHT' / 'UP' / 'DOWN' keys are supported. Zooming in and Out is also possible using the keyboard when not in fullscreen mode. 'SHIFT' or '+' zoom in, 'CTRL' or '-' zoom out. Please be aware that in fullscreen mode all keyboard control is disabled. You have to use the mouse navigation features in this mode. This is not a bug in Mountainpanoramas, the Flash / Browser combination does generally not support keyboard control in fullscreen mode.